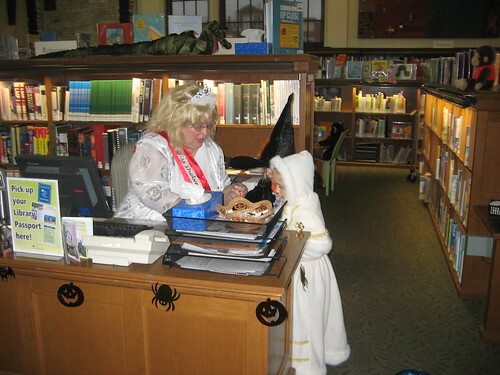 Not only is Halloween on a Saturday this year, it’s also Daylight Savings Time, which means more time to gather treats. Don’t forget to set your clocks back one hour before you go to bed tonight, too. While you’re at it, the Seattle Fire Department wants to remind everyone that Daylight Savings is a good time to also change your smoke alarm batteries. The SFD will even install smoke alarms and batteries for free for homeowners who are senior citizens, living on low income or have a disability. To request this assistance, call the Seattle Fire Department at 206-386-1337. This year marks the Troll’s 20th birthday, and in celebration of the day, this year’s theme will be Dante’s Inferno. 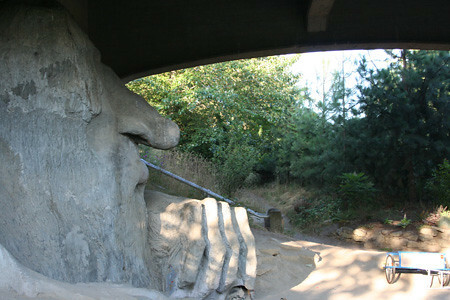 Rain or not, everyone is invited to join in the merriment through Fremont that begins at the Troll at 7:00 p.m. Following the procession, there will be an aerial dance performance of Daedalus by the Cabiri. If it’s raining, the show will take place under the Fremont Bridge. If not, they’ll be in the lot across from Theo Chocolate. 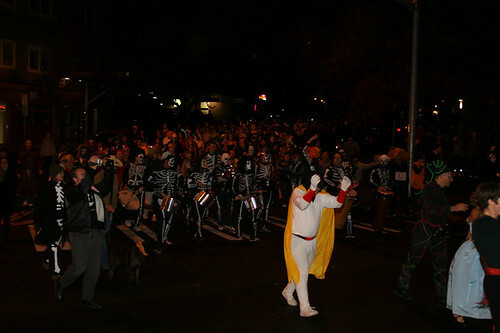 The “Haunt of Fremont” heads west on 36th to Evanston Avenue N; south on Evanston to N 35th Street; west on 35th to First Avenue NW; south on First Ave NW to N Canal Street (which is closed from First Ave NW to Phinney Avenue N for a performance of Dante’s Inferno); east on Canal to N 34th Street; east on 34th to Evanston; south on Evanston to private street; east on private street to the Fremont Bridge. 3:00-10:00 p.m. – N. Canal St. between 1st Ave NW and Phinney Ave N.
4:30-8:00 p.m. – N. 36th St. adjacent to the Troll between Linden Ave N. and Whitman Ave N.
For more information, you can visit the Trolloween Facebook page here. 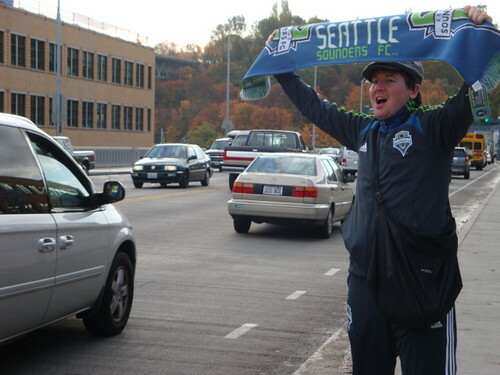 Buzz is all about for the city’s newest and shiniest sports sensation, the Seattle Sounders, this week. On Thursday, they kick off Game 1 of a two-match semifinal series in the MLS Playoffs here at home. 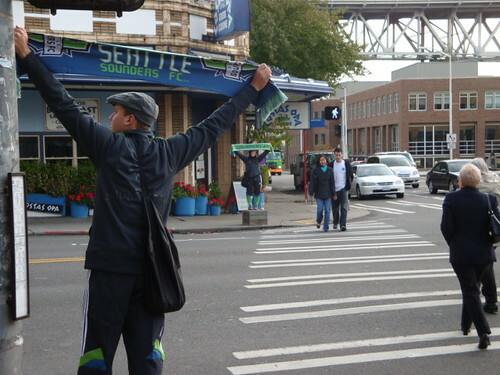 We spotted a Sounders crew in Fremont this morning trying to get fans excited for Thursday’s match against the Houston Dynamo at Qwest Field (they had another crew in Ballard). Not that the team needs any help drumming up ticket sales. In fact, tickets have been hard to come by all season. Playoff tickets went on sale Saturday morning and sold out within 30 minutes. Due to overwhelming response, though, the Sounders have opened up 3,000 more seats in the upper level at Qwest Field. Tickets start at just $20 and you can buy them online here. After community efforts to clean the green space around the Fremont Troll, plans are moving forward to develop the area thanks to help from the city. This weekend, Kimberly Scrivner of Friends of the Troll’s Knoll learned they have received a $6000 grant through the Department of Neighborhoods Small and Simple Neighborhood Match Fund Grant. This brings a total of more than $12,000 to help them begin planting trees along Aurora and for mulching the blackberries that were cleared by SDOT crews a couple of months ago. 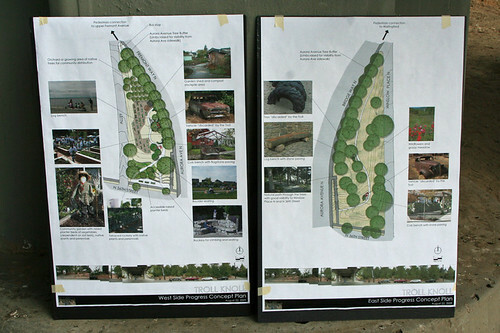 The grant follows a “Clean and Green” event attended by Mayor Greg Nickels in August that gave neighbors a first look at preliminary plans for revitalizing the green space surrounding the Troll. Scrivner spearheaded the Friends of the Troll’s Knoll project to help make the area on each side of the Aurora Bridge on N. 36th St. and Troll Way a safe and more utilized interactive space in the Fremont community. Tonight, she will be presenting the preliminary project designs at the Fremont Neighborhood Council meeting at 7:00 pm. to get additional input. Several community meetings are being planned to get feedback from the neighborhood and to discuss next steps. We’ll keep you posted with more information. After several months of watching it come together, LTD Bar + Grill (309 N. 36th St) is finally opening it’s doors to the public on Saturday. Co-owner Brian Parks describes it as the “only ‘true’ sports bar in Fremont”. The menu is “high-quality pub fare”, with prices ranging from around $3.25 for a pretzel to $11.25 for steak and fries or meatloaf. There’s also lots of comfort food staples in between, like Tator Tots, Fried Pickles, Mac & Cheese Wedges and Pigs in a Blanket (all $4.95-$5.95). 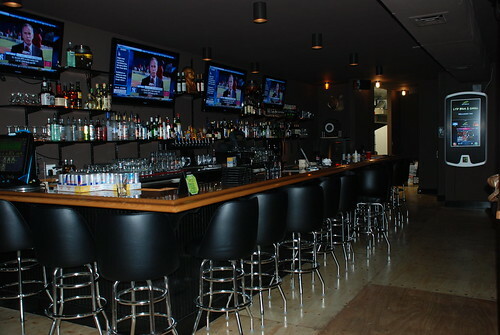 Eleven flat screen TVs line the walls around the bar and are viewable from virtually any spot inside. There’s also a pool table, air hockey and 12 beers on tap. That giant iPhone looking thing hanging on the wall (above) is a digital jukebox. Gone are the days of discreet song selections here! 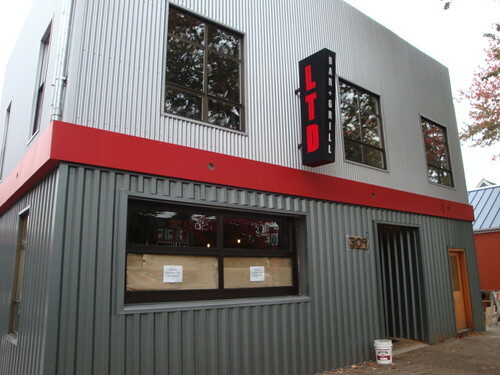 LTD will be open for lunch during the week at 11:30 a.m. and 10 a.m. on the weekend. Happy Hour is from 3:00-6:00 p.m. Monday through Friday when several food items will be 4 to 5 bucks. On Sundays, you can catch a game on TV and enjoy the Sunday Special – a burger and beer for $6.95. The 2-day event follows reports of at least three jumping incidents within a single week recently. According to statistics from Seattle FRIENDS (FRemont Individuals & Employees Nonprofit to Decrease Suicides), a person attempts suicide from the Aurora Bridge an average of once every three months, and the bridge is the nation’s second deadliest bridge for suicides. Suicide is a serious public health issue. In 2007, King County had 223 suicides; 11% of all deaths investigated by the Medical Examiner’s Office. The phones on the bridge are a lifeline for SOME, although the phones alone have not significantly changed the rates of suicide attempts from the bridge. And, while a physical barrier on the bridge may be effective, we also need to continue to invest in health care and mental health for everyone so that there are no barriers to getting help for anyone who needs it. For anyone who wants to get help for themselves or someone they know, the number for the 24-hour crisis line is 206-461-3222 or 866-4CRISIS. You can also visit www.crisisclinic.org for more information. Friday, October 23: A 24-hour prayer vigil begins on the bridge at 5:00 p.m.
Saturday, October 24: Pancake breakfast at Vine Christian Ministries (4000 Whitman Ave N) from 8:00 a.m.-10:00 a.m. Give what you can. All proceeds will go to the Crisis Clinic. Saturday, October 24: Group walk over the Aurora Bridge at 10:30 a.m.
Saturday, October 24: Neighborhood BBQ at Vine Christian Ministries at 3p.m. Give what you can. Proceeds benefit the Crisis Clinic. If you want more information on any of the events, or to volunteer or donate money, visit Take Back The Bridge’s website. Fremont boutiques Dream and Bliss have a new little sister to add to their flock, this one named Finch & Sparrow (3420 Fremont Ave N). This is the third shop for owners Neil Silverman and John Tseng, who describes this space (formerly Reprographics Northwest) as their “accessories store”. 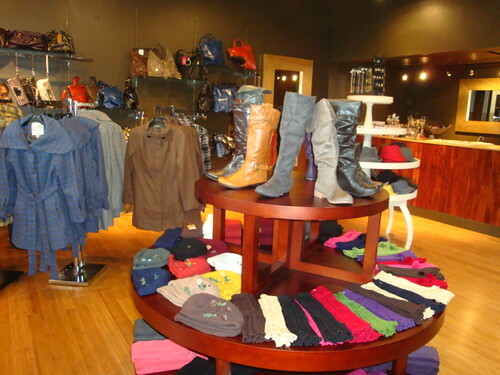 This shop is all about the trimmings – mostly handbags, jewelry and shoes can be found here. Yoga-inspired “lifestyle clothing” and outerwear will be the only clothes items rotated seasonally. Finch & Sparrow softly opened their doors on Saturday so fashionistas can shop while they continue to get settled. The Grand Opening is slated for November 27 (yes, Black Friday) when local designers will be in-house to help officially kick things off. 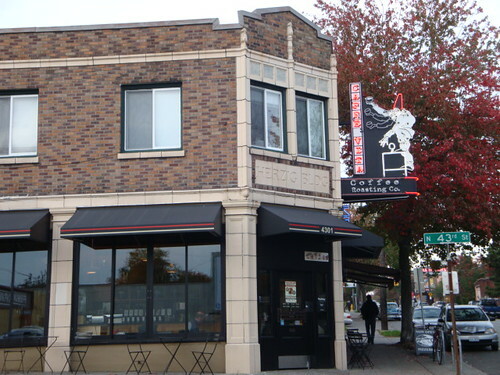 With boutiques now occupying three corners in the heart of Fremont, only time will tell what the fourth corner will be. We’ll just have to wait for a little birdie to tell us.